A young punk lies dead after a duel with Gregory Peck in The Gunfighter. Henry King's underrated The Gunfighter (1950) presents the other side of the Wyatt Earp saga, while presaging films that portray the cost of being a gunfighting hero, such as High Noon(1952) and The Man Who Shot Liberty Valance(1962). While Earp's rival Johnny Ringo also served as the model for Stagecoach's Ringo Kid, The Gunfighter’s weary Jimmy Ringo (Gregory Peck) has more in common with Lorne Greene's ballad "Ringo." Fans of the recent Tombstone (1993) will recall Ringo's (Michael Biehn) Latin word duel with Val Kilmer's Doc Holliday. While Earp and, to a lesser extent, Holliday committed their most bloody acts under the blessing of the law, Ringo has killed men in the course of robbery, for hire, or in answer to challenges from lesser opponents. With the reputation as the fastest gun, Ringo finds himself challenged in every town by a young upstart. Two different young men assert that "he's got two hands like everyone else," to convince themselves of Ringo’s fallibility. Calmer heads observe that the best a man can hope for in a showdown with Jimmy Ringo is second. As an infamous killer, Ringo is stalked by these younger men who seek to usurp his life and his notoriety--even if, as in the case of Wild Bill Hickok or Jesse James, they have to shoot the gunsmith in the back to do it–-and by older men who want revenge for fallen fools. Henry King's film ticks away the minutes with a tension that Fred Zinnemann would tighten in High Noon(1952). Jimmy Ringo is being trailed by three brothers for the death of their arrogant, younger brother--who insisted on taunting the "great Jimmy Ringo" into a gunfight. Gregory Peck embodies the bone-tiredness of a man who only wants a drink in peace--and becomes a pinata for every hotshot looking for a short cut to infamy. After stranding the older brothers on foot, Ringo takes refuge in Cayenne, hoping to see his estranged wife (Helen Westcott), ever aware that he must escape before the murderous brothers arrive. The clock on the Palace Bar wall serves as the hourglass for his remaining life. The gunfighter is literally and figuratively trapped by his fame. He watches the minutes pass until an avenging brother arrives; he is confined to the bar by the calamity that his presence has called; and he seems doomed to be chased from town to town by the glamor of his past deeds. He is sheltered by his old riding buddy Mark who has become the town's sheriff. The thinness of the line between lawman and gunman is constantly demonstrated in this film. At one point, Jimmy takes over for the deputy and places his would-be assassin in jail. 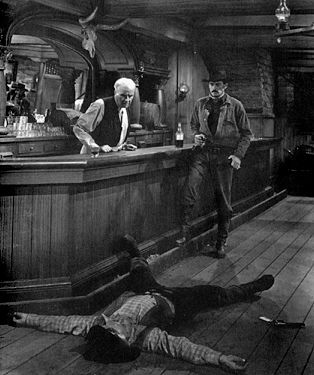 But for most of this action-lite Western, Jimmy waits in the bar, as schoolchildren (including the son he has not seen since infancy), disapproving matrons, and curious men stand in the street in hopes of catching a glimpse of the legend. When he's asked by his own son (who doesn't realize the Ringo Kid is his father), "Who's the toughest man you ever knew? Wyatt Earp? ", Ringo replies, "The real tough ones laugh at Wyatt Earp." When pressed further, he names Mark as the toughest man he ever knew, which shocks the 9 year-old: "He doesn't even wear a gun. We even call him 'softie.'" In the vision of Ringo and this film, truly tough men--like Mark and a newly-married rancher--can walk away from the empty glory of violence. Though this film may be more of a character study than a typical Western, Gregory Peck’s nuanced performance as the gunfighter not-too-jaded-to-hope is worth viewing. The colorful supporting cast includes '60s-'70s TV stars Ellen Corby, Alan Hale, and Karl Malden.